Have a small plate with a thin layer of water on it, and another plate for your red sugar and white sprinkles. If working with kids you might want to have separate plates for the red sugar and white sprinkles to avoid mixing them together. Open up a fruit roll up. The flavor I used was called Berry Tie Dye. Half of it is red and the other half is a purplish color. I used a knife and sliced the roll up down the center and just used the purple side. Insert a lollipop stick into a marshmallow. Dip the top of the marshmallow into the water just to get it wet. Next, roll the sides of the marshmallow in the water to get the marshmallow wet. Dip the top of the marshmallow into the white sprinkles. Roll the sides of the marshmallow in the red sugar. Cut the fruit roll up down the center to make a thin strip. You will want enough to go around the marshmallow and overlap by about 1/4" or so. Dip your fingertip in water and wet one side of the roll up strip. Wrap the roll up strip around the marshmallow. When it overlaps, the wet roll up will stick to the overlap. Use yellow sparkle gel to draw on a simple buckle. 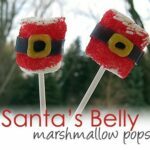 This recipe for Santa’s Belly Marshmallow Pops was printed from AmandasCookin.com - https://amandascookin.com/santas-belly-marshmallow-pops/ and can only be printed for education or personal use.